" I became interested in wine at a very early age and have half fond memories as a child of being taken by my father and uncle to cellar doors in McLaren Vale and being allowed to have the odd sip of a fortified and entertaining myself by throwing rocks in the car parks. By the age of fourteen I went and did a couple of weeks work experience at Hanging Rock Winery in Mt Macedon in Victoria and I had an inkling that this could be the career choice for me. I liked the concept of some science, physical work which got the hands dirty and the social and sales side of wine. At the tender age of 17, I enrolled in a Bachelor of Oenology at Roseworthy College. I have worked for twenty years now in McLaren Vale for such notable companies as Geoff Merrill Wines, Tatachilla Winery, Maxwell Wines and Redheads Studio as well as vintage jaunts in Italy and France. 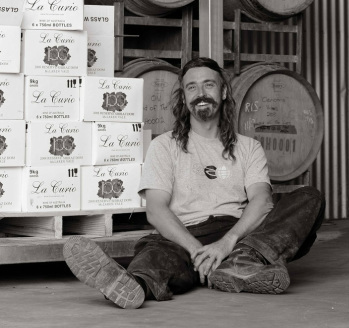 I started La Curio 10 years ago - a boutique wine brand with a focus on old plantings of Shiraz and Grenache. In recent years I have enjoyed also crafting small cuvee's of Primitivo and Sangiovese as part of the La Curio stable, as well as consulting on a larger scale to a number of clients. I hope that you enjoy these rare and beautiful wines"
Vale Cru from Vale Cru on Vimeo.